For very short distances, such as freeing the vehicle, you can use the detachable towing hook that mounts on the anchors in the front and rear bumpers. 1. Put cloth on the edge of the cover. Carefully pry with a small flat-tip screwdriver or a metal fingernail file to remove the cover. 3. 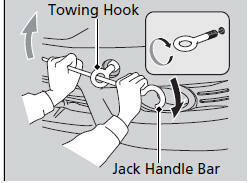 Screw the towing hook into the hole, and tighten it with the jack handle bar. To avoid damage to your vehicle, use the towing hook for straight, flat ground towing only. Do not tow at an angle. This hook should not be used to tow the vehicle onto a flat bed. Do not use it as a tie down. Make sure to use the properly-designed and attached towing equipment. Do not slip the clutch for a long time to get unstuck. This may overheat and damage the transmission. If you cannot open the tailgate use the following procedure. 1. 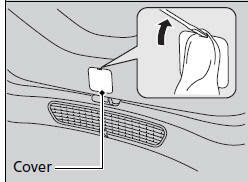 Use a flat-tip screwdriver and remove the cover on the back of the tailgate. 2. 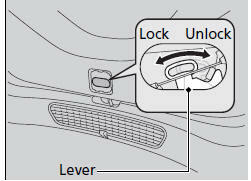 To open the tailgate, push the tailgate while pushing the lever to the unlocking direction. 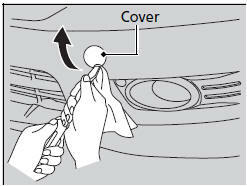 What to do-Following up After taking these steps, contact a dealer to have the vehicle checked. When you open the tailgate from inside, make sure there is enough space around the tailgate, and it does not hit anyone or any object.